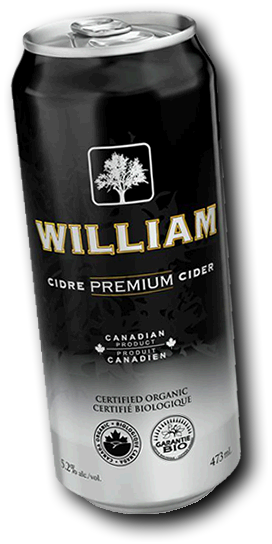 William Premium Cider‘s mouthfeel is a little different. It’s nicely carbonated (although if you’d asked me after my first sip, I probably would’ve said “aggressively carbonated.” That has more to do with sneezing upon taking a sip than the amount of carbonation, really. My nose hurts.) There’s a lingering “thickness” after you swallow. It’s kind of gross. Even that sentence describing it was gross. Gross. The colour is: goldeny. Very golden. Maybe slightly more than S’bow (this looks a little syrupy.) I can’t really comment definitively as I don’t have a pint of Strongbow in front of me to compare it to. Rookie mistake, I know. It smells pretty S’bowy, though. You know how Strongbow is the cider for people who don’t like cider (or the idea of cider, anyway)? That’s because it’s not particularly apple-y. Nor is William Cider. There’s like, a hint of apple. It doesn’t have a strong scent, really. Actually, what it reminds me of more than anything is walking into a tobacconist. Which is weird, because it doesn’t smell like tobacco at all. Maybe it’s a stale, dried fruit smell? Yum! Honestly. This just seems like a poor man’ S’bow. Except I don’t think it’s any cheaper –don’t quote me on that; I keep throwing out my receipts– and I don’t like the packaging as much. The packaging seems… I dunno… lazy somehow. I don’t mind the image and the typeface, but the plain ol’ black gradient background is snoozeville. (Excuse me, Snoozeville.) Also, Strongbow has a special place in my heart, and it just simply can’t be replaced by some pretender . This entry was posted in Cider Review and tagged Apple Cider, Cider, Dry Cider, Hard Cider, Organic, William Cider. Bookmark the permalink. Totally disagree. William has better ingredients and a great taste. Made in Canada, not Belgium. No contest. What a fackin awful review bud. You’re probably right. But it amuses me.